After you schedule your home inspection with Four Seasons Property Inspections, Inc., here is what you can expect – we’ll be on-site about 3-4 hours, depending on the square footage of the home, if the property is occupied or not, and if the home buyer or realtor attends the inspection. Our inspections take a little longer than other companies because we leave no stone un-turned, always completing a full and thorough inspection. Unlike other home inspectors that test a sample of the home’s features, at Four Seasons Property Inspections we make sure we test every part of your home thoroughly. 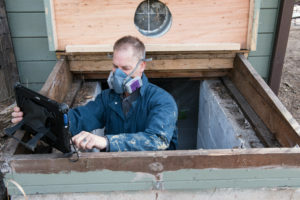 We’ll email you a detailed home inspection report with photos and a summary advising you of the safety and action items you should know about. Click here to see a sample home inspection report. We strongly recommend that you test for radon gas. It is the 2nd leading cause of lung cancer today. We use continuous monitoring devices to record the hourly levels and have the results within 48 hours. This testing is available for $154.00.